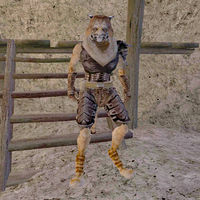 Dro'Zhirr is a Khajiit thief hiding out in Shushishi, in the mountains to the east of Caldera. He has stolen some jewels from Aeta Wave-Breaker. You will be tasked by her to retrieve these items from Dro'Zhirr, who may be willing to hand them over peacefully if you promise him half the reward. He wears a netch leather cuirass with matching greaves, left pauldron, and pair of gauntlets. He carries a demon tanto along with Aeta's expensive ring and amulet. Like all Khajiit, he can see well in the dark and can demoralize others for short periods; otherwise he knows no spells. "Heirlooms? Hah! Dro'zhirr has found plenty of heirlooms. They just seem to fall into his pockets! In fact, Dro'zhirr just found a few new pieces earlier today. Took them from some Nord woman. Cried like a baby, she did. 'Oh, my precious jewelry!'" "I thought you were going to return those things to the Nord woman? You'd better get going, or Dro'zhirr will have to take the jewels back from you." "You've met her, huh? What has that got to do with me? Dro'zhirr is in this for the cash, not for some ridiculous sentiment. No more to say to you, unless you've got a better offer." I'll bring them back to her, then give you half of what she pays me. : "Hmmm...an interesting bargain. If the woman pays you what she says, that would be a great deal better than what Dro'zhirr can get for them from our associates. Sounds like a fair deal, friend. Make sure you come back with my share, though. Dro'zhirr has friends who wouldn't be happy to know he's been cheated." I just want the jewels. : "Nothing else to say? Then as far as I'm concerned, you're just another victim, trespassing on my property. You'd better leave. Now." This page was last modified on 25 August 2016, at 19:31.